To invite general public, for subscribing the shares of a company, it makes a public issue, by way of an Initial Public Offering (IPO). However, when a company seeks to raise funds, without making a public issue, then it has the option of the private placement, wherein, the securities (shares and convertible debentures) are issued to private investors, not exceeding 200 members in a financial year. There are two kinds of the private placement, namely, preferential allotment and qualified institutional placement. There are instances when people juxtapose preferential allotment for private placement. 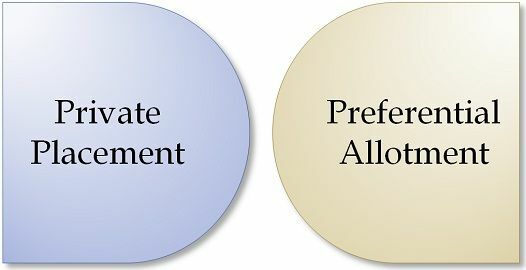 The preferential allotment is when the company allots securities to a few select persons based on preference. This article excerpt deals with the difference between private placement and preferential allotment. Meaning Private Placement refers to the offer or invitation to offer made to specified investors, for inviting them to subscribe for shares, so as to raise funds. Preferetial Allotment, is the allotment of shares or debentures to a selected group of persons is made by a listed company, to raise funds. Consideration Payment is made by way of cheque, demand draft or other modes except cash. Cash or consideration other than cash. Bank account To keep the application money, separate bank account in a scheduled commercial bank is required. Not required. Articles of association Articles of association of the company must authorize it. No authorization is required. The private placement implies selling of securities, i.e. debentures or equity shares, to private investors, with the aim of raising funds for the company. According to section 42 of the Companies Act 2013, the private placement is one in which a company makes an offer to selected persons such as mutual funds or insurance companies by issuing a Private Placement Offer Letter and satisfying the conditions thereon. The offer or invitation to subscribe for securities can be made up to 200 persons or less, in a financial year, not including qualified institutional buyers and securities issued to employees by way of Employees Stock Option Plan (ESOP). If a company makes an offer or invitation to offer to issue or enters into an agreement to issue shares to persons more than the limit prescribed then it will be considered as a public issue and regulated accordingly. The company making private placement has to make allotment of securities to the investors within 60 days from the date of receipt of the application amount, or else it has to refund the same within 15 days to the investors. If the company defaults in refunding the money to the subscribers within 15 days, then the company is liable to pay the entire sum with interest @ 12 % right from the 60th day. Preferential Allotment is used to mean the issue of specified securities by a company listed on a recognized stock exchange, to any select person or group of persons, on preferential basis. The offer is subject to the rules and regulations made by Securities and Exchange Board of India, in this regard. However, when an unlisted company goes for preferential allotment the rules of the Companies Act, 2013 will apply. The allotment is authorized by the company’s articles of association. The company’s members must pass a special resolution, or it is approved by Central Government. The securities issued through preferential allotment should be fully paid, when the issue is made. As per SEBI takeover code, a preferential allotment exceeding 25% of equity constitutes an open offer to the existing shareholders. Shares issued to promoters as preferential allotment are subject to a lock in period of three years, and so they cannot transfer such shares. Nevertheless, the securities issued to other investors are subject to lock-in period of one year only. Private Placement can be described as an offer or invitation to offer made to specified investors by issuing securities, so as to raise funds. On the contrary, Preferential Allotment is the issue of shares or debentures to a particular group of persons is made by a listed company, to raise funds. Private Placement is governed by section 42 of the Companies Act, 2013. Conversely, in the case of Preferential Allotment section 62 (1) of the Companies Act, 2013 will apply. In the case of private placement, ‘Private placement offer letter’ is sent to the investors for inviting them to subscribe for shares. As against, in the case of preferential allotment, no such offer document is issued to people. In private placement, application money can be received through cheques, demand draft or any other banking modes but not cash. Unlike, preferential allotment in which the money is received in cash or kind. In private placement, the application money is kept in the separate bank account of a scheduled commercial bank. On the contrary, no such account is required in case of preferential allotment. The private placement must be authorized by the articles of association of the company. In contrast, no such authorization is required in case of preferential allotment. Both Private placement and Preferential allotment require special resolution, to be passed at the company’s general meeting. Further, in both the cases, the company does not make an advertisement to the general public. Many times, the investment bankers suggest the firms wanting to go public, to make a private placement, because the public issue requires a critical mass, to justify an Initial Public Offering. I heard that my sister is looking for a broker to help her with the private placement process. She wanted to sell her restaurant because she needs to use the money that she will be getting to pay for the surgery of her husband. It’s the first time that I’ve heard about it, so thanks a lot for explaining it well. Like you said, it is to offer private investors to allot shares for fundraising purposes.